1 "Blech," someone croaked behind me. Rusty tried to stand up, holding his middle with both hands. His face was pale beneath his rust-toned flat top. "I don't feel so good." 2 He staggered to the control panel of the MTP. He stared bleary-eyed at the dials and buttons. Then he started fiddling with stuff. Usually, we didn't have to adjust the capsule controls when we were on a trip. "What're you doing?" I asked. 3 "Something didn't sound right when we landed," he said. "I'm checking some things." So Rusty had heard the sound, too. It hadn't been just my brain flipping out. 4 "Rusty can fix it," I told myself. Rusty is our tech guy. He's about one tenth mechanic and nine tenths techno geek. If it's got dials and switches, Rusty's got its number. I was glad he was on the job. 5 As my stomach settled, I stepped to the door of the capsule. I listened and then slowly opened it a crack. Bright sunlight hit me in the eye. I couldn't see anything. It seemed quiet, though. No rampaging buffalo or sword-wielding pirates. That wasn't always the case. You never could be sure where you would land. 6 I put on my shades and stepped out the door. After a moment, I began to make out shapes. We seemed to have settled in a flat, rocky spot. It was wide open country-just some scraggly bushes here and there. Not a tree in sight. 7 Just in front of us the earth dropped off like you'd cut it with a knife. We'd landed near the edge of some rock cliffs. Below us, a wide canyon went on and on in the distance. 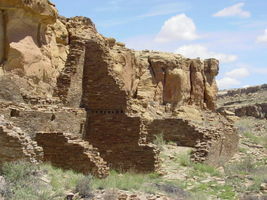 I knew from our study that it was Chaco Canyon. Behind me, the others stepped out of the MTP. "Look!" Prunella said. "Someone's out there!" 8 She pointed directly in front of us. In the glare of the sun, we could make out very little. Then I saw a slight motion. There, on the edge of the cliffs, a figure stood. It made a dark outline in the blinding sun. Then it turned and vanished off the edge of the cliff.